Comments: Old Hall was built circa 1830 on the southwest corner of Byrd and Harrison Streets (Lots 167 and 168) in Scottsville. It is a good example of a house built during the transition from Federal to Greek Revival style and employs elements of both styles. The building is a T-shaped, three-bay, two-story house with an English basement. A striking element of the house is its tripartite windows on the front of the first and second floors. These are unusual in either the Federal or Greek Revival styles and one of few examples in Virginia. By 1980, Old Hall had been owned by only three families and was virtually unaltered, except for the addition of a nursery in 1851, the installation of plumbing and electricity, and the addition of brick steps on the front portico, and a back porch. Although there is no extant official record of this house's ownership from 1830 to 1892, the Beal family said that the house was built by a builder/architect named William Magruder for James W. Mason. 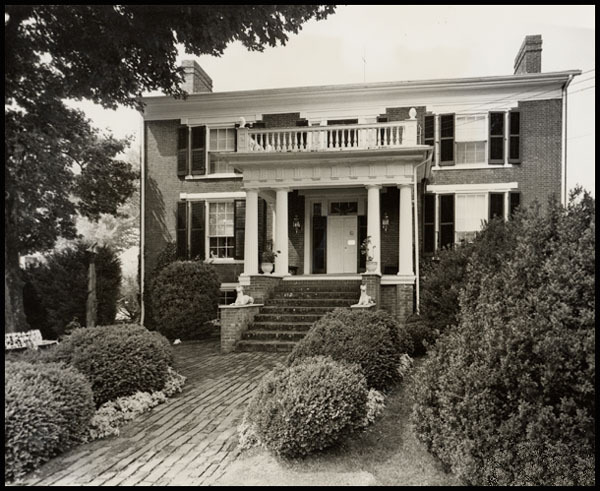 Mason was the president of the Bank of Scottsville and brought his bride to live there. Old Hall is often called the James W. Mason House after its first owner. After Mrs. Mason inherited Hatton Grange, they sold Old Hall to Joseph R. Beal in 1856. Old Hall then remained in the Beal family for over 101 years. Over the years, the Beals held grand parties with musicians reportedly standing on the stair landing while guests danced below in the hall. In March 1865, General Merritt commandeered Old Hall as his headquarters during Sheridan's raid on Scottsville. According to Virginia Moore's book, Scottsville on the James, Merritt ordered the Beal family to the basement. "Old lady," said General Merritt to the mistress of Old Hall, "we've come to starve you to death." Mrs. Mary Elizabeth Beal answered with spirit, "Then you'll have to pull up every sprig of cress salad in Gantt's low grounds. It's spring." According to Virginia Moore, the Beals were reduced in circumstances by the Civil War like most Southerners. Between 1882 and 1883, the Beals rented Old Hall to Dr. John S. Andrews and his wife, Dr. Oriana (Moon) Andrews, who operated a hospital there called the First Sanatorium of Southside Albemarle. By 1892, Joseph R. Beal's will bequeathed Old Hall to his sons, William S. and Jackson Beal, and to his daughter Nellie Beal (Albemarle County Will Book 30, page 89). In 1931, William Beal died and left his part of the house to his brother, Jackson. After Jackson Beal's death, his widow sold Old Hall to Mr. and Mrs. Robert Walls on November 15, 1957 (Albemarle County Will Book 298, page 047). The above photo of Old Hall was taken by Ed Roseberry in 1973. 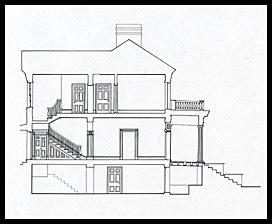 The drawings of Old Hall at right were drawn by Kate Black, 1982. 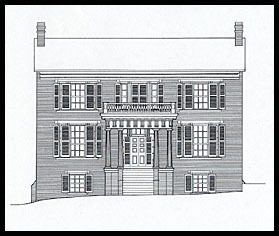 They are provided with some of the above architectural highlights of Old Hall by the courtesy of the Library of Congress, Prints and Photograph Division, Washington, D.C. 20540; Call Number: HABS, VA, 2-SCOTS, 6.